I've been doing male massage for over 10 years now and I truly love what I do. As a submission wrestler and fitness trainer, I bring a very unique approach and sense of the body to the men I work on. I'm trained in Swedish techniques and Amma therapy which is a Korean pressure point massage method. I combine the various healing modalities I have learned so that I may provide you with a memorable and highly unique experience. My sessions can be geared toward your specific tastes and needs in all kinds of ways. The pressure I use as well as the environment the sessions take place in can all be custom tailored to your liking--all you have to do is ask. I do my work on a traditional table or a very large wrestling mat--both sessions are extremely healing in a number of ways. I work in a spacious, peaceful and tranquil private studio on a quiet street in the historic district of the West Village. I keep the lighting dim during your session to help you ease into the experience and allow your entire body to relax. Unscented candles add to the intimate mood while I work on you, and you'll be lulled into a deeper state of relaxation by the soothing sound of ocean waves playing in surround sound. What's most important to me is that your overall experience is one that invites you to let go and relax completely, and one that inspires you to come back again and again. 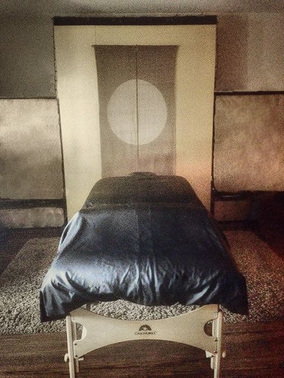 I offer my clients the best of both worlds: bodywork that is both sensual and therapeutic. I believe that the mind and body are very much connected and that bodywork can help facilitate both physical and emotional healing if we allow it to do so. I approach each client as the unique individual they are and tailor each session intuitively based on what I sense and feel is going on in your body. Your direct input also greatly influences the kind of treatment you receive so before the session begins I will ask you what is going on with you so I can best serve you. Fortunately I have a very high rate of repeat clients because they appreciate quality bodywork by a man who cares about how they feel and knows intuitively how to please them.